Planting season is upon us and with this comes choosing a variety of plants to add color and bold foliage to our yards. Native plants are a good choose for anyone. Once established, native plants are more drought tolerant, thus saving you water. So we’d like you to consider the Nifty Fifty, the 50 most water-smart plants to create an oasis of abundant proportions, that is also ecologically-friendly. Many of them native plants, they have been selected for their attractiveness, their nursery availability, their non-invasive natures, their easy maintenance, their long-term performance, and of course, because once established, they are drought tolerant. When thinking of semi-arid weather conditions, one’s mind often goes to succulents. A mixture of aeonium, agave, aloe, and hens-and-chickens is a good beginning. Mix it up with some groundcover such as ice plant, trailing lantana, sedums and stonecrops, woolly thyme, and of course one of the myriad varieties of rosemary, and you’ve added color, texture and scent. 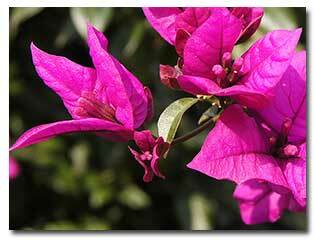 For the garden structures, use a bougainvillea vine, or a yellow orchid vine. And height and color can be added to your gardens with perennial lavender species, salvias, penstemons, California sunflowers, and Peruvian verbena. Let’s frame the basic garden layout we’ve set out above with some ornamental grasses, and grass-like plants. Try the New Zealand Cabbage Tree, mixed with Pennisetum setaceum ‘Rubrum’ (aka Red Fountain Grass) and Pink Muhly Grass. Next, shrubs for more height and privacy. The natives Manzanita, California lilac, Western redbud and Oregon grape, along with Common Myrtle and Coastal rosemary are eager examples of just how varied a water-wise garden can be. If you’re a tree lover, the Nifty Fifty can guide you to the most drought-tolerant trees available. The Australian willow, the Crape Myrtle, the Sweet Bay Magnolia, the Chinese Pistache and Coast Live Oak are all fine additions to the water-wise garden. We hope we’ve gotten you started on your way to choosing California Natives. You’ll see the positive results of incorporating water-smart plants in your garden when you receive your water bill, and when you realize that beauty need not be strictly traditional. For further answers to your questions, visit our garden pro’s. Las Pilitas Nursery’s guide of when to plant California Natives.